The T6 measures 1.4 centimeters thick, and the watch casing measures about 17.4 square centimeters with a display area of 3.1 centimeters. These dimensions are a testament to the compactness of the T6, a major plus for the device that Suunto undoubtedly made an effort to deliver. Because of its low profile, the T6 can be worn inconspicuously even as a casual watch without turning eyes, something the comparable The Polar S625X cannot claim. The sturdy black casing encloses a display made of mineral glass (as opposed to the hard plastic of the S625X), which is one of the best cuff and scratch resistant materials out there. And if you want even more protection, optional display shields are available from Suunto. The device weighs in at a lightweight 1.9 ounces, 0.2 ounces less than then S625. Once again Suunto has minimized bulk in order to eliminate as much as possible the burden of exercising with a watch strapped to your wrist. The tactile buttons are located on the sides of the watch, with two on the left and three on the right side. These buttons are not easily depressed, and require moderate pressure to activate. While this may seem unintuitive at first, it serves the function of preventing accidental button depressions during vigorous workouts. 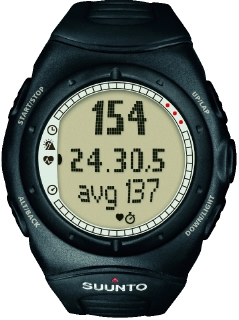 In terms of watch display, Suunto utilizes a dot-matrix grid system to provide the maximum amount of textual readability and organization. Around the display, the casing is all rounded, with no edges or places that could potentially snag on clothing. The rubber strap retains the color scheme of the main casing, and is composed of durable rubber. There are slits cut into where the strap is particularly thick near the watch face to increase breathability, and the strap is secured by a traditional buckle clasp. If you want to wear the watch on the outside of a jacket, Suunto also sells an extension strap made of the same black elastomer. 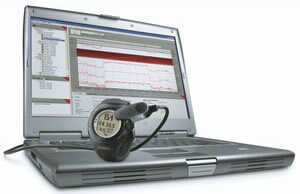 The T6 also comes with a "datasnake," a cord that connects the watch to a USB port on your computer. 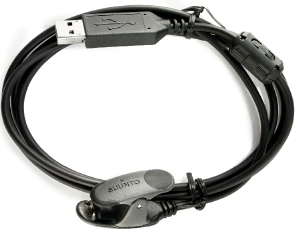 This is the cable that transfers log files and statistics from your device to Suunto's personal trainer program for analysis. Finally, the last element of the T6 package is the "smart belt". This heart rate belt fits around the chest area and, using a 2.4 GHz frequency over designer Dynastream's ANT network, wirelessly transmits data to the T6. Overall, I'm very pleased with the design of the T6. As with previous Suunto watches I've reviewed, Suunto has managed to pack a slew of features into a comparably small and lightweight device whilst retaining high standards of ruggedness.